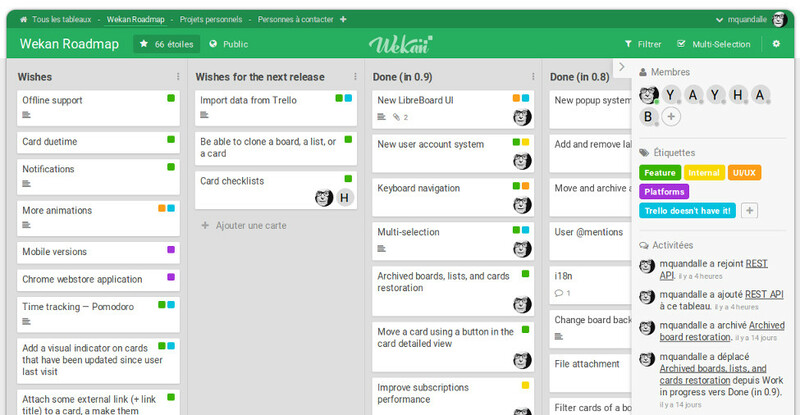 Wekan is an open-source kanban board which allows a card-based task and to-do management, similar to tools like WorkFlowy or Trello. Wekan allows to create Boards, on which Cards can be moved around between a number of Columns. Boards can have many members, allowing for easy collaboration, just add everyone that should be able to work with you on the board to it, and you are good to go! You can assign colored Labels to cards to facilitate grouping and filtering, additionally you can add members to a card, for example to assign a task to someone. There's a video of the developer showing off the app, as well as a functional demo. For added privacy, this design secures wekan behind an oauth2 proxy, so that in order to gain access to the wekan UI at all, oauth2 authentication (to GitHub, GitLab, Google, etc) must have already occurred. If you wanted to expose the Wekan UI directly, you could remove the oauth2_proxy from the design, and move the traefik-related labels directly to the wekan container. You'd also need to add the traefik network to the wekan container.